Now I can read E-book in Café Elité and not look like a geek. …the question arose about whether Wendy Davis could read from her iPad during the course of her filibuster and it was determined that, yes, for the purposes of the current legislative process, an iPad counted as paper. This conference will explore the problems and potential of the fake from antiquity to the present. With an attentiveness especially to material texts and objects, the conference will consider how falseness and inauthenticity threaten our sense of reality – historical, material, theological, racial, sexual, national, linguistic – while at the same time informing it. As we increasingly come to understand selfhood and identity as social constructions and performances, what remains at stake in distinguishing between the real and the false? What connections might we draw between the social construction of selves and the material construction of documents? What do forgeries and fakes tell us about our reliance on objects, our quest for certainty, and our relationship to the past? How have the notions of inauthenticity, falseness, and counterfeiting changed throughout history, and how do they differ across cultures? What role does technology, modern and pre-modern, play in enabling, complicating, and preventing the production of fakes? The scope of the conference will be interdisciplinary, and we welcome papers from a wide range of academic fields (literature, history, sociology, history of science, philosophy, information science, media studies, linguistics, art history, etc. ), spanning all time periods and all linguistic/national traditions. Submit 300-word abstracts for 15-20 minute papers to thehistoryofthebook@gmail.com by Tuesday, October 1, 2013. The Material Cultures of the Book Working Group is happy to announce that we have received a UCR Mellon Workshop Grant for the 2013-2014 academic year! The title of the project is, “The Material Cultures of the Book,” and this grant will allow us to conduct workshops with scholars from a variety of fields to discuss the materiality of book history and print culture. The Mellon Workshop Grants are made possible by the UCR Center for Ideas and Society, and many thanks go out to all of the group members, both faculty and graduate students, for putting together a great proposal. Stay tuned for upcoming workshops, presentations, and talks beginning this fall. In my previous post on the Global Archivalities Research Network, I described the recent virtual conference and the range of topics discussed. The concept of addressing the “social logics” of the archive was compelling, and it helps to reframe the discourse involving archival studies as one of complexity and imagination. Another interesting concept, presented at the virtual conference by Dr. Filippo De Vivo, was “to turn the source into the problem.” By this, De Vivo meant to consider how the abundance and variety of archives across the globe could be a point of convergence rather than a point of apprehension. Instead of being overwhelmed by the immensity of the task, scholars should move even further into the myriad dynamics of archival networks, considering multiple agencies and pathways despite a lack of clear boundaries. De Vivo considered this move toward an even more open concept of the archive as a strategy used successfully by historians of the book. By “enlarging the scope of the research” historians of the book, as noted by De Vivo, were able to create a field of research that was wide enough and inclusive enough to contain within itself multiple dimensions of study. In this case, relevance comes not from precisely describing the task at hand within certain academic limits, but instead by motioning to the immensity of the task and welcoming new interpretations. Indeed, this is the direction that Global Archivalities is taking by considering what might be referred to as non-traditional archives, non-archived archives, and archives outside of state control. At our recent Material Cultures of the Book meeting at UCR, we discussed some of these very issues regarding archives, but in the frame of book history. The title of Heather Van Mouwerik’s post about this gathering, “Fixity in an Ephemeral Meeting,” speaks to the problem of defining books or texts with any concrete sense. However, rather than falling into a pit of despair we concentrated on the possibilities of research, and how the concept of the book itself can be a point of study. 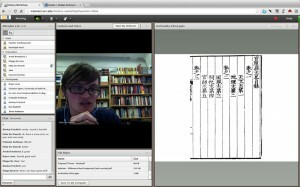 On May 7th I attended the first event of the new Global Archivalities Research Network. This was a virtual conference hosted over Adobe Connect, with a viewing location in the UC Riverside History Library. The group is organized by Dr. Randolph Head of University of California, Riverside, Dr. Arndt Brendecke of Ludwig-Maximilians-Universität München, and Dr. Hilde De Weerdt of Kings College London. The digital aspect of the conference allowed many other scholars from across the globe to join, which added greatly to the international scope and diversity of archives that were discussed. Thanks to the steady hand of fellow UCR graduate student, Heather Van Mouwerik, the technological aspect of the conference went off without a hitch. Van Mouwerik spent many hours in the weeks preceding the conference ensuring that all technological details were considered. Most virtual workshops or conferences are a one-to-many format, meaning that one presenter maintains control of the video and audio, and audience participation is limited to textual responses. However, with presenters in California, Munich, Madrid, and London, there was a definite need for a more complex video conferencing arrangement. There are many video conferencing services, but none of them fit the needs of this workshop exactly. Using Adobe Connect, Van Mouwerik was able to maintain control of bandwidth by manually promoting each speaker to the primary position, and demoting others to view-only status as needed. Also, Van Mouwerik made sure that the workshop could be digitally recorded. The video recording should be made available soon at http://globalarchivalities.org, allowing participants to review the material, and other interested scholars to engage in the content after the fact. 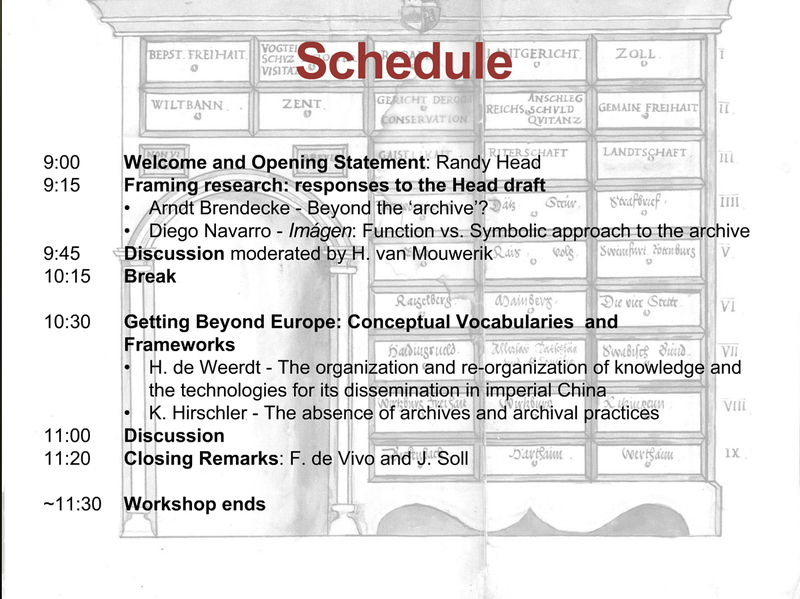 The title for this event was “Global Archivalities: A Conceptual Workshop,” and the most contentious portion of the virtual conference was the usage of the term “archivalities” itself. The word archivalities is meant to convey a sense of process and movement through the study of various archives of all forms, and through all parts of the historical record. The grand scope and inclusiveness of the project is the major factor in calling for such a term, and archivalities is a difficult but perhaps necessary starting point. Even the notion of the archive itself carries a Western connotation (not to mention Weberian and Foucauldian notions of state bureaucracy and institutional power), and in other languages the use of archivality or the suffix “ality” could present confusion. Other similar terms have been showing up in academic circles lately, such as documentality and spectrality, so perhaps archivality could find a toehold, however tenuous it might be at the moment. Throughout the conference many of the presenters were moving toward a common goal of reconsidering archives and archival practices throughout history. Archives are not necessarily a representation of state power, and collections of artifacts and documents are not always considered an archive at the time of their assembly. Dr. Diego Navarro Bonilla spoke of the need to consider “little” archives as well as the larger bureaucratic ones, and he also touched on the importance of archives as a place of both creation and destruction. In line with this notion of destruction, De Weerdt expressed that archives can also be considered as a process or strategy for coping with loss. Archived documents could themselves be destroyed, and in the wake of devastating events, such as a natural disaster or the death of an individual, archives could also be a form of collective memory. 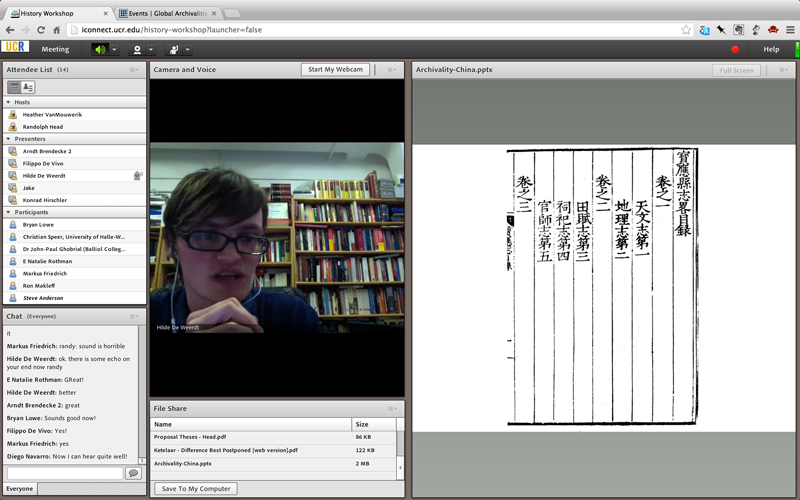 Dr. Hilde De Weerdt presenting at the Global Archivalities Research Network virtual conference. The inclusive nature of this research group allowed for scholars located across the world to participate, and it also provided for a wide range of historical reference. The archives discussed included collections of ninth century Japanese scrolls, the examination system in thirteenth century imperial China, the legal archives carried by judges in the Middle East prior to the year 1500, as well as early modern European archives. Such a broad range of archival material greatly enriched the discussion, adding a sense of wonder to the possibilities for comparative study. Most interesting in the discussion was the idea put forth by Dr. Konrad Hirschler that each archive carries its own “social logic.” As historians we must be careful to not privilege materials that have been archived in the Western sense over non-traditional archives (such as a collection of Inca quipus), or even non-archived archives (such as a genizah). This notion of “social logic” means that we must consider how and why the collection of materials came to be, and the thought processes surrounding their assembly. The “social logics” of the archives are especially important, because there is no way to study all the archives across the globe. However, historians can compare the “social logics” of archives in a broader sense. If scholars can “consider the archive in a much more creative way,” as proposed by Hirschler, new social connections and new opportunities for research will emerge. This event was sponsored by the University of California Multi-Campus Research Group “Material Cultures of Knowledge, 1500-1800,” funded by the University of California Humanities Network and the University of California Humanities Research Institute. THURSDAY . May 30 . 4:30 PM . INTN 1113 . Refreshments served . Cindy Keefer, Director of the Center for Visual Music Los Angeles, will discuss and screen work by pioneers of kinetic art, abstract animation and pre-digital cinema from CVM’s archives. CVM is a Los Angeles archive dedicated to visual music, experimental animation and abstract media. CVM preserves and promotes films by Oskar Fischinger, Jordan Belson, Charles Dockum, Mary Ellen Bute, Jules Engel, Harry Smith and others, as well as contemporary artists. Keefer will screen work from CVM’s archives by Fischinger and Belson, plus Dockum’s Mobilcolor Projections, Bute’s Abstronics (an early oscilloscope film), a short Bute documentary, and more. She will also discuss Belson’s now legendary 1950s Vortex Concerts, CVM’s work with the Fischinger legacy, current preservation work, and Raumlichtkunst, the new HD 3-screen reconstruction of Fischinger’s 1920s multiple-projector performances, recently exhibited at the Whitney Museum, the Tate Modern, and scheduled for exhibition at the Palais de Tokyo in Paris in summer 2013. 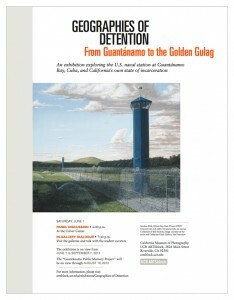 UCR ARTSblock presents Geographies of Detention: From Guantánamo to the Golden Gulag, on view at the California Museum of Photography from June 1 through September 7, 2013. The exhibition is guest curated by Catherine Gudis, Molly McGarry, and graduate students from the UCR Public History Program: Leann Do, Jay Hartzell, Kristen Hayashi, Corinne Knight, Sean Milanovich, Karen Raines, Carolyn Schutten, Megan Suster, Jennifer Thornton, David Wagner, and Jennifer Weed. Presented on two floors of the California Museum of Photography, Geographies of Detention offers a nuanced investigation into incarceration and its architectures. One portion of the exhibition highlights work by artists Sandow Birk, Alyse Emdur, and Richard Ross, each of whom explores different aspects of imprisonment. Geographies of Detention also includes the traveling exhibit the “Guantánamo Public Memory Project,” an examination of the over 100-year history of the US naval station at Guantánamo Bay, Cuba. The main gallery of the museum is devoted to the contemporary context and landscape of California’s own “golden gulag.” Prison populations in California have grown 500% in the last decades even as crime rates subside, and prison spending continues to outweigh state funding for public education. A selection of hauntingly evocative paintings by Sandow Birk from his series “Prisonation” (2001) reflects on the growth of California’s prison industrial complex by engaging its geographic context. Taking inspiration from pictorial genres of landscape painting, including those popularized by the Hudson River School in the 19th century, each of Birk’s paintings depicts one of California’s state prisons, from Pelican Bay in Northern California to Centinela State Prison at the US–Mexico border. While Birk’s work shows the prisons from afar, Richard Ross and Alyse Emdur take the viewer inside these structures. In his series of photographs “Architecture of Authority” (2007), Ross explores the built environment of prisons, revealing the spatial logic used to exert power over the bodies incarcerated within. Emdur’s large-scale photographs of prison visiting rooms and collected letters and snapshots (some of which appear in her 2013 book, Prison Landscapes) offer a more intimate vision of inmates posing with their visitors against murals in fantasy landscapes of freedom. Presented together, the works of Birk, Ross, and Emdur meditate on the “carceral state” of California. The “Guantánamo Public Memory Project” combines historical and contemporary photography, film, and first-person audio interviews to examine how the naval base has been “closed” and reopened for more than a century leading up to the attacks on September 11, 2001. These new perspectives on Guantánamo’s history as a “legal black hole” provoke discussions about the limits of democracy and the meaning of mass incarceration in a global present and future. Collaboratively curated by eleven universities (including UCR), the “Guantánamo Public Memory Project” is comprised of a deeply researched traveling exhibit, as well as a website (www.gitmomemory.org), blog, and ongoing public conversation. The panel produced by graduate students in UCR’s Public History Program examines Guantánamo as an international symbol of America’s War on Terror and a lightning rod for debates about torture, detention, national security, and human rights. Visit artsblock.ucr.edu for the schedule of related programs. *The “Guantánamo Public Memory Project” will be on view as part of Geographies of Detention through August 10, 2013. This exhibition was made possible in part by the generous support of Dean Stephen Cullenberg, UCR College of Humanities, Arts, and Social Sciences, and the UCR History Department’s Friends of Public History. 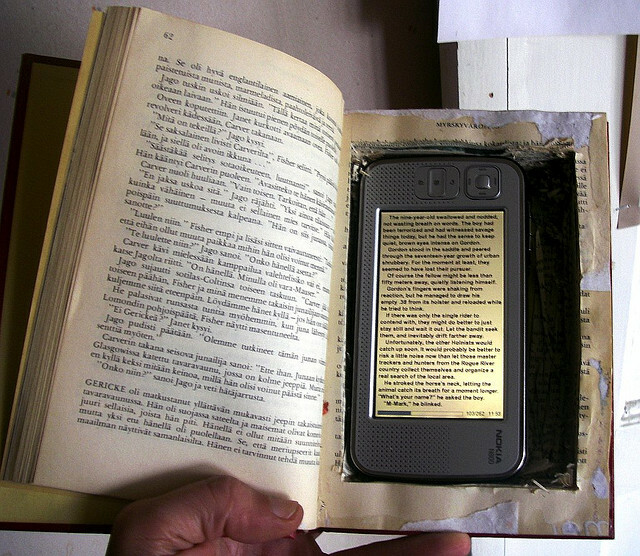 Please pardon the obtuseness of this post’s title, but much of the discussion at our last meeting was about physical as well as temporal fixity of texts. When is a book a book? When did people in the past begin considering it a book? Is a book permanent or is it mutable? Among many other questions with which book historians struggle daily, these quests for rootedness fascinate me! In the English Library for the meeting–coming, going, eating, writing, reporting, listening–we personified the more fleeting, ephemeral aspects of book history. Some of us had accessed the materials on iPads, some computers, and some as printouts. In discussing the fixity of the book, we were in flux. Perhaps it is just that time of year, midterm spring quarter, but the idea of change, process, and flux–both in our own lives as well as historically–sharply illuminated our discussion on definition and, yes, fixity. There is a yet inarticulate connection for us to make between the materiality of the book and its context: the mutable book alongside the well-defined, the stable book alongside its process of definition. Coming out of this meeting, it seems to me that the greatest struggle is to keep these necessarily multifaceted understandings in dynamic tension with eachother. I posed the question “when is it a book?” We attempted to address this both historically as well as in the process of book-making. We addressed issues of fixity: is it a book when it is set down permanently or is there a necessary mutability to a book? Also issues of truth: Differentiating between accepted (oral) truth, versus a fixed, contained truth. Is there something about the borders or limits of a book that imbue it with reliability? D.F. McKenzie (whose lecture “The Broken Phial” had been the reading for the meeting): Challenges to McKenzie’s conceptualization of texts, distinct from books. Difficulty of his reliance on narrative to classify something as a text. Thank you, Schuyler, for organizing this meeting!